A Tree Carving in California: Ancient Astronomers? Amazingly, Saint Onge had just identified the West Coast's only known Native American arborglyph, one long hidden behind private property signs. But the discoveries didn't stop there. After spending more time at the site, Saint Onge realized that the carved crown and its relation to one of the spheres was strikingly similar to the way the constellation Ursa Major  which includes the Big Dipper  related to the position of Polaris, the North Star. "But as a paleontologist, I live my life looking down at the ground," says Saint Onge, who runs an archaeological-consulting firm out of nearby Arroyo Grande. "I didn't know much about astronomy at all." He quickly learned that the constellation rotates around the North Star every 24 hours, that its placement during sunset could be used to tell the seasons and that the Chumash people also revered this astronomical relationship in their language and cosmology. "It's the third largest constellation in the sky and they saw it every single night for tens of thousands of years," says Saint Onge. "It was like the TV being stuck on the same channel playing the same show nonstop." 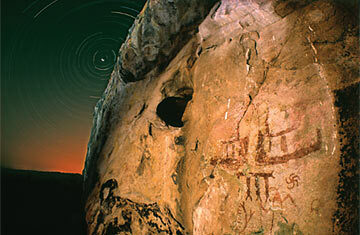 It became increasingly obvious to Saint Onge that the arborglyph and related cave paintings weren't just the work of wild-eyed, drug-induced shamans  which has been a leading theory for decades  but that the ancient images were deliberate studies of the stars and served as integral components of the Chumash people's annual calendar. "This gives us an insight into what the indigenous people of Central California were doing," says Saint Onge, who published his theory last fall in the Journal of California and Great Basin Anthropology. "It wasn't just the daily simpleton tasks of hunter-gatherers. They were actually monitoring the stars." Neither man knows how long ago the tree was carved  though they speculate that a Chumash family that lived on a nearby hillside until they all died in the 1918 flu epidemic may have tended to the arborglyph as the bark and lichen grew back  but they're just relieved that Saint Onge was able to find it at all. "The upkeep of the motif itself has gone by the wayside and it's not long for the world," says Saint Onge, explaining that carpenter ants are attacking the limbs, "so I think it was a good thing that we came across it when we did."